The number of unsaturated isoprenoid chains on the side chain of the Vitamin K2 are varied, they are usually referred to as MK-n in brief, in which n represents the number of isoprenoid chain. 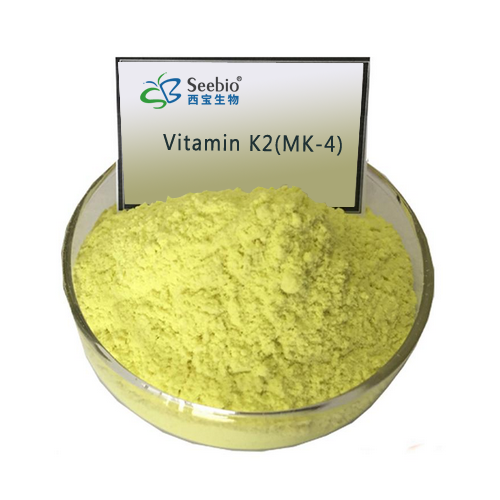 The active forms of vitamin K2 are MK-7, MK-4 and MK-9. The biological activity of Vitamin K2 is significantly higher than vitamin K1. In the normal metabolism of human body, when the gastrointestinal function is in the normal state, the normal intestinal flora will the participate in the transformation from vitamin K1 or K3, K4 to vitamin K2 living body, and then they can be absorbed by the body. Appearance: pale yellow to yellow crystal powder/oil. Treat and prevent osteoporosis, bone protein can be generated by Vitamin K2 and then co-generate bone with calcium. Vitamin K2 can increase bone density and prevent fractures. Vitamin K2 can prevent cirrhosis from developing to liver cancer. It can treat vitamin K2 deficiency hemorrhagic disease, promote the formation of prothrombin, accelerate blood clottingand maintain normal clotting time. It has the function of diuretic and improving the liver's detoxification. Latest science study results showed that severe aortic calcification and the relative risk of CHD mortality was reduced with vitamin K2. It can be used as anti-osteoporosis drugs or nutraceuticals.